A day trip to Split town is a great day out for lovers of shopping, culture, architecture, history, sightseeing, food and drink and art! A guided walk will take you around the old Roman town, located within the walls of Diocletian’s Palace and full of wonderful discoveries. Then plan your own route; will it be shopping, stopping for a delicious lunch or chilled glass of wine in the main square or people watching along the seafront? Transfers (bus and ferry), guide and entrance fees are included in the price. 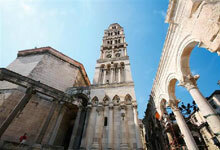 Diocletian's Palace (UNESCO heritage site) – is the heart of Split where with the most significant historical buildings. The Palace is one of the most famed and integral architectural and cultural constructs on the Adriatic coast and is holding an exceptional place in the Mediterranean and European heritage. St. Duje's cathedral was built as a mausoleum for Roman emperor Diocletian and it was later repurposed to a cathedral. It is one of the world oldest cathedral with a beautiful tower with and great panoramic view to the area of Split, mountains and islands. Peristil square (Peristylium) is the main square in front of the cathedral and in Diocletian time it was a historic court connected to Diocletian's Mausoleum on the east, and to three temples on the west. Jupiter's temple – was an ancient Roman temple and in 6th century it was St. John's baptistry. Two Original Egyptian sphinxes, brought in 3rd century to Split from Eygpt by emperor Diocletian are placed in the front of the cathedral on the Peristil square and in front of St. Jupiter’s temple. Riva is the main city beautiful promenade with a lot of cafes and bars where you can enjoy your drink and observe the passengers. 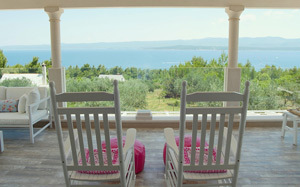 Marjan is a hill situated on the west of Split peninsula. It is an oasis for many people who look for a natural stress relief, a great place for long walks, jogging, and bike rides. Varoš is one of the oldest parts of town. It’s part of the city where fishermen and peasants lived in the past full of narrow streets and beautiful stone houses. Galerija Meštrović is a gallery contains works of Ivan Meštrović, worldwide famous Croatian sculptor. After a short sail to Split and an interesting drive along the coast, Šibenik is the first destination on this excursion. Here stands one of Dalmatia’s most valuable religious monuments - the 15th century St. Jacob’s Cathedral. 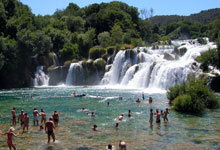 The tour continues on by coach through the karst Šibenik hinterland to Krka National Park and its well-known waterfalls. The waters of the Krka River cascades over 17 natural barriers, creating countless small and large waterfalls, framed by lush green vegetation. A walk on the paths through the woods and over the falls with rushing water just inches beneath your feet is an awesome experience.